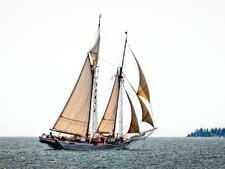 Built in 1980, Angelique was modeled after 19th-century sailing vessels that hauled granite, lumber and other goods. 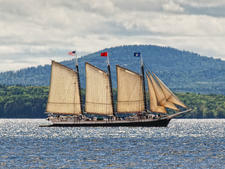 The vessel has red sails, a nod to 19th-century English fishing trawlers that had cotton sails treated with tannin and red ocher to strengthen and preserve them. 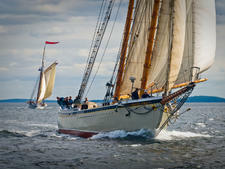 Angelique's sailing season begins in late May and ends in early October. 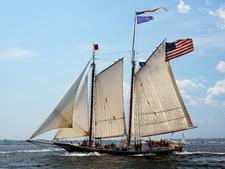 The two-, three-, four-, six- and 10-night cruises leave from Camden, Maine. 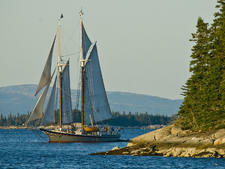 There are themed cruises focused on wildlife or whale watching, a yoga cruise, and a wine and foliage in cruise October. 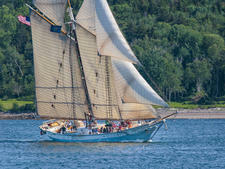 Like other windjammers, Angelique's daily course is subject to the wind and tide, but the ship has two auxiliary diesel engines if the wind fails. Since days are unplanned, passengers can chose to lounge on the expansive 95-foot-long deck or, those interested in learning to sail need only ask and you'll get a lesson in the basics of blue water sailing. You can do as much or as little as you like, including taking a turn at the helm, hoisting sails, cranking the anchor or helping plot a course. The ship stops at quiet villages and rugged islands, giving passengers time to hike and explore. Some may choose to swim or borrow the ship's rowboat or try stand-up paddleboarding on Angelique's two hand-built wooden paddleboards. Angelique has 15 cozy cabins, each with a sink, reading lights, fresh bedding and towels and a USB charger for small electronics. The cabins range in size from 35 to 50 square feet. There are three bathrooms, or heads, below decks. Angelique has three hot water showers, two below deck and one on-deck for rinsing off after a swim. While modeled after a traditional fishing vessel, the ship has a deckhouse saloon with a piano and plenty of seating for those wishing to get out of the weather while remaining on deck. The mess, or dining area, is below decks and doubles as a game room and gathering place in the evening. Meals are prepared from fresh, local ingredient and served family style. 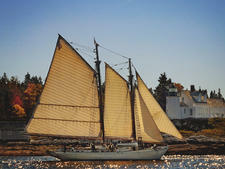 They can include roasted meats, soups, stews, local fruits and vegetables, and Maine seafood. Every cruise includes an all-you-can-eat lobster bake on one of the hundreds of islands in Angelique's cruising grounds. The ship does not serve alcohol or soft drinks, but passengers can bring their own for storage in the ship's icebox. Cell phones are allowed onboard, but passengers should be discreet. The minimum age is 12.